Our extensive range of high visibility clothing meets the stringent requirements in safety, design and construction which ensures it meets the latest international high visibility standard EN ISO 20471. 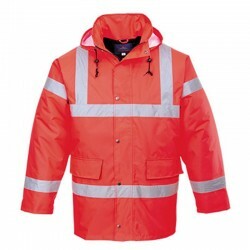 Our high visibility clothing is categorised dependent on the fabric and styles required. Our 300D Oxford weave fabric is a tough 100% polyester fabric that is ideal for tough conditions and has excellent abrasion and tear resistance. Our Sealtex Ultra fabric is a highly breathable polyurethane (PU) coated fabric on a flexible 100% polyester, tricot knit. Sealtex Ultra is waterproof, windproof and breathable, these high visibility items will keep you warm and dry in adverse weather. Our Kingsmill fabric is a cotton/polyester mix available in 4 weights and ensures maximum comfort and performance for high visibility workwear clothing. Hercules GO/RT 3279 EN471 Class 2 Polycotton Bib & Brace Regular Leg 80% Polyester 20% Cotton Reflec.. If you're looking for an alternative to a knee band or ankle band trouser, look no further than our ..
Orange Class 3 long sleeved Knitted polyester fabric,2 bands and brace style on the body with 2 band.. If you need maximum Class 3 hi-vis protection but don't want to wear thick jackets and coats, our li..
High Quality Reflective Tape - 2 Band & BraceBlack PipingVelcro FasteningWashable Durable&n..
Class 2 waistcoats.EN471. Knitted polyester fabric,2 bands andbrace style with Velcro front ..
Orange Class 1 trouser. EN471 PU coated polyester outer shell, fully taped seams, side access, elast..
Yellow Class 1 trouser. EN471 PU coated polyester outer shell, Fully taped seams, Side accessElastic.. This specialist anti-tangle vest has been designed as a comfortable and safe garment for track side ..
Berlin Executive Vest.Revolutionary in its design the executive vest combines the light weight of a ..
Classic Junior Rain Jacket. Designed to be worn over clothes in wet weather conditions the JN11 is p..
Classic Junior Rain Trousers. Like the Rain Jacket the Rain Trouser is lightweight and easily packab.. Contrast Bib and Brace - Lined.A garment designed to be completely practical and safe the Contrast B.. Contrast Bib and Brace - Unlined.Flexible elasticated back for a comfort fitEnsures safetyProtects l..